"Gretchen" 2016 Ohio State Fair 1st Place Slick Shorn Ewe, Reserve Grand Champion Ewe! #607 - February ewe lamb - 2nd at 2016 North American and 3rd at 2016 Ohio State Fair. "Gretchen" 1st Place Slick Shorn Ewe Lamb 2015 Ohio State Fair and 2nd Place 2015 Indiana State Fair. 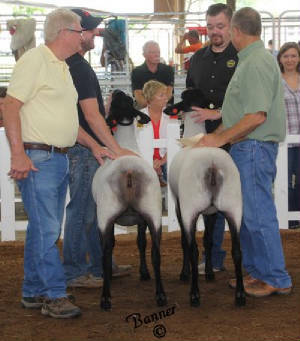 2014 Ohio State Fair 2nd and 3rd place slick shorn ewe lambs. #475 "Odessa" and #485 "Grayla" daughters of pevious state fair winners continue the tradition. Thanks to Jim Brandt for helping show. 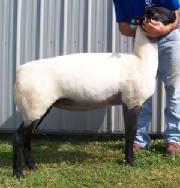 #139 Ewe lamb that won her class slicked at Indiana State Fair - she was 2nd at Ohio State Fair! Her 1/2 sister on dam's side was ewe that won early slick class at 2010 Louisville and the then won 2011 Ohio Suffolk Yearling Ewe Futurity! 2012 2nd Pair Slick Shorn Ewe Lambs at National Suffolk Show, Louisville - 283 "Ilana" & 286 "Grietta"
Thanks to Jim Brandt and Steve Myers for helping show. 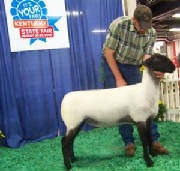 299 "Abigial" 4th Place Late Slick Shorn Ewe Lamb at 2012 National Suffolk Show, Louisville. 017 Slick Ewe - "Zane" Won 2010 Ohio State Fair as slick ewe lamb - won 2011 Ohio State Fair and Indiana State Fair as Slick Yearling Ewe. Call to get your name on list for genetics like this. 934 Yearling Ewe - 1st Place Slick Shorn Yearling Ewe - 2010 Ohio State Fair - She was 2nd at 2009 Ohio State Fair (to our other ewe lamb) and 1st at 2009 Kentucky State Fair - Slick Shorn! 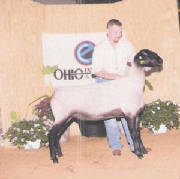 1st Place Slick Shorn Yearling Ewe at 2011 Ohio State Fair and Indiana State Fair! We Bred 4 of the 1st 5 Place Slick Shorn Ewe Lambs at the 2017 Ohio State Fair! Call now to get your name on 2018 & 2019 list! Yearling Ewes - muscle, bone structual correctness, good rib shape. List for 2018 & 2019 lambs is growing. To get females like these give us a call and get on the list. 1st and 2nd Place Slick Ewe Lambs at the 2009 Ohio State Fair and 2nd Pair of Ewe Lambs. 1st and 3rd Place Slick Ewe Lambs at the 2009 Kentucky State Fair and 2nd Place Pair. #934 Ewe to left was 1st Place in 2010 Ohio State Fair Slick Shorn Yearling Ewe Class and #963 Ewe to Right was 2nd in 2010 Ohio Suffolk Yearling Ewe Futurity! Don't miss you chance to purchase Ewes like these. Ewes with Bone, Muscle and Substance. The list is growing for 2019 and 2020 lambs. Don't miss your opportunity to purchase proven genetics. on their purchase of ram and ewe lambs and wethers in 2018. Contact us to sign up for 2019 and 2020 lambs- List is growing! 1st and 2nd Place January Slick Shorn Ewe Lambs 2017 Ohio State Fair. Copyright © Wiford Suffolks - all rights reserved.